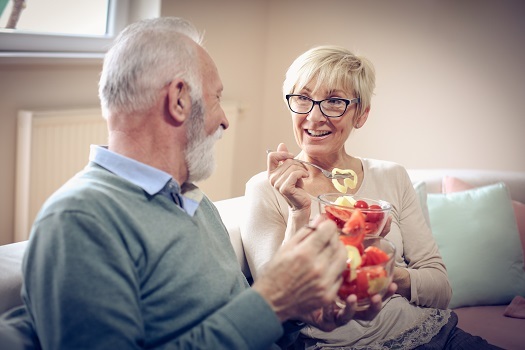 Meal preparation is one area where many seniors face difficulty, and you need to know your aging loved one has a steady stream of healthy meals he or she can choose from when you’re short on time. These six meals can all be prepped ahead of time so all your loved one has to do is mix or heat them up. Seniors with arthritis or hand weakness often skip adding vegetables to their meals because of their inability to chop them up. However, most veggies stay fresh for up to a week after they’re chopped, which means you can do this part of the cooking ahead of time so all your loved one has to do is mix up the salad. Grilled chicken adds a healthy dose of protein to your loved one’s lunch or dinner salad, but you can also boil eggs to add if he or she prefers. Egg muffins are perfectly portioned breakfasts your loved one can simply heat up in the microwave. To make them, whisk eggs until they’re blended and fill a muffin cup halfway, then add your loved one’s favorite veggies and bake them in the oven. You can experiment with different combinations, such as bell peppers and onions, so your loved one never gets bored. Veggie egg muffins last for five days in the refrigerator, or they can be frozen so your loved one has no excuse to skip this most important meal of the day. Sometimes aging adults experience cognitive decline that causes them to simply forget to eat, take their medication, or perform other important daily tasks on their own, which could put their safety at risk. Many seniors prefer aging in place over moving to an assisted living facility. If your senior loved one needs assistance to remain safe and comfortable while living at home, reach out to Home Care Assistance, a leading Oshkosh home care agency. Our dedicated in-home caregivers can assist with meal prep, bathing and grooming, exercise, medication reminders, and many other important tasks. Seniors sometimes skip dishes such as lasagna because the recipes tend to make so much food. However, lasagna can be made in smaller portions by layering the ingredients in a loaf pan or muffin tins. Once you’ve assembled the lasagna, the portions can be frozen for up to a month. You can also use thinly sliced vegetables such as eggplant or zucchini in place of the noodles and switch to ground turkey rather than sausage or beef to increase the healthiness of your loved one’s favorite recipe. These dishes have softer textures that are perfect for seniors who also face difficulty with chewing. From chicken noodle to beef stew, you can chop the ingredients ahead of time so your loved one can simply throw them into the pot. Alternatively, you can completely cook the stews or soups and freeze them in individual portions. Some seniors need a higher level of assistance to ensure they get enough nutrition, exercise, and mental stimulation and that their daily needs are met. If your senior loved one needs hourly or live-in care, Oshkosh Home Care Assistance can help. Our caregivers can assist with exercise and mobility, prepare nutritious meals, provide timely medication reminders, and help with a wide array of other important daily tasks. Every senior needs a hearty meal that’s easy to just heat up when hunger sets in. Try switching out the rice in your loved one’s favorite stuffed bell pepper recipe with another whole grain such as quinoa to increase the nutritional value, then freeze or refrigerate the peppers for your loved one to enjoy throughout the week. Oatmeal is a wonderful way to get some fiber into your loved one’s diet, yet he or she may not have the time or energy to make a bowl of oats. Give your loved one a diverse set of breakfasts by cutting up fruits that can be added to the overnight oats, then show him or her how to put oats, milk, and other flavorful ingredients into a jar to sit overnight. When your loved one wakes up in the morning, a delicious breakfast will be ready, just waiting to be enjoyed. Eating well is a vital component of staying healthy, but seniors often find making their own meals challenging. With these six easy-to-fix alternatives, your loved one will have tasty choices that provide the nutrients he or she needs. If your loved one needs assistance with planning and preparing meals or accomplishing other simple tasks of daily life, help is just a phone call away. Seniors who want to remain healthy as they age can benefit in a variety of ways when they receive professional home care. Oshkosh, WI, Home Care Assistance is here to help your loved one accomplish daily tasks, prevent illness, and focus on living a healthier and more fulfilling life. To learn about our high-quality in-home care services, give us a call at (920) 710-2273 today.